1Press the Playback button to set your camera to playback mode. Display the picture in single-image view. If the monitor currently displays multiple thumbnails, just press OK to switch to single-image view. 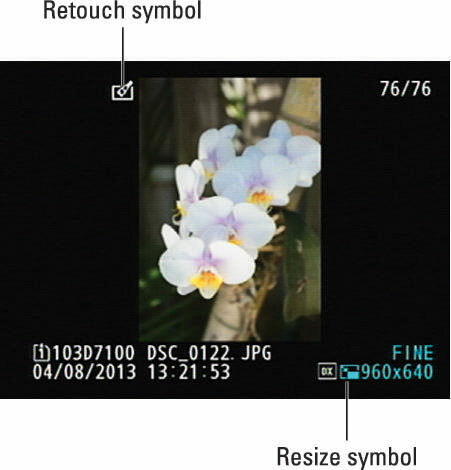 2Press the i button to display the Retouch menu over your image. 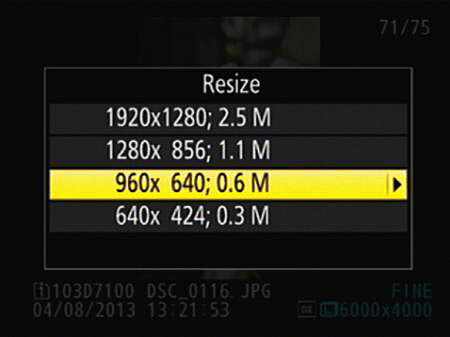 The Resize feature creates a low-res, e-mail–friendly copy of a photo. 3Highlight Resize and then press OK or press the Multi Selector right. You see the screen shown on the right in the figure. 4If two memory cards are installed, highlight the card where you want to store the small copy. Press the Multi Selector right. The screen shown appears, offering the list of size options (stated in pixels) available for your small copy. The second value stated for each option is the megapixel count — total pixels, with one megapixel equal to 1 million pixels. 5Highlight the size you want to use for your copy. Press the Multi Selector right to display a confirmation screen. 6Highlight Yes and then press OK. The camera duplicates the selected image and downsamples (eliminates pixels from) the copy to achieve the size you specify. 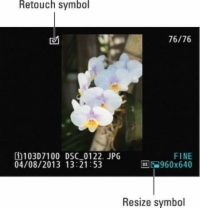 When you view your small-size copies on the camera monitor, they appear with a Retouch icon at the top of the screen and a Resize icon at the bottom.